I picked up my new Rebel last week. So far, I really like it. The day I signed the papers I also ordered OEM towing mirrors, since I tow my Jeep a lot. When I went to pick them up, they informed me that the power fold function would not work anymore once the mirrors were installed. I was shocked! Please tell me that the parts guy was just wrong. It just doesn't make any sense that mirrors that are 4" wider won't power fold. 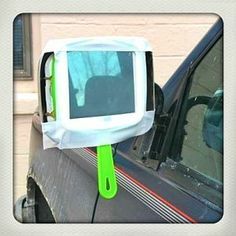 If this is the case, is there an option out there to retain all stock functionality, but still have a true towing mirror? Any input would be greatly appreciated. I checked on this when I ordered mine. I believe the parts guy is correct. Normal mirrors have power fold, towing mirrors don't. You can fold them, but by hand. Go figure! I went with the normal mirrors and find that they are adequate for the towing that I do. I agree, the stock mirrors are quite big and have a longer neck than most stock mirrors I've seen. They're at least double the size of the mirrors I had on my Dakota. I'm still getting used to them. Just stick one of these on your regular power folding mirrors. Much cheaper than buying the extended towing mirrors. Be sure to orient it with handle-in, mirror-out to get the full benefit of the extension. I was going to put towing mirror on but when I found out I would lose the folding fiction I changed my mind. I tow a horse trailer and 30ft travel trailer. I just add extensions when I tow. Works great. 1Aauto has towing mirrors WITH powerfold... but they cost the same as OEM without powerfold. They snap right on, a special cutout is there for the light on the mirror. In order to fold in the mirrors with these attached you'll have to file some of the plastic trim on the inside of the mirror. 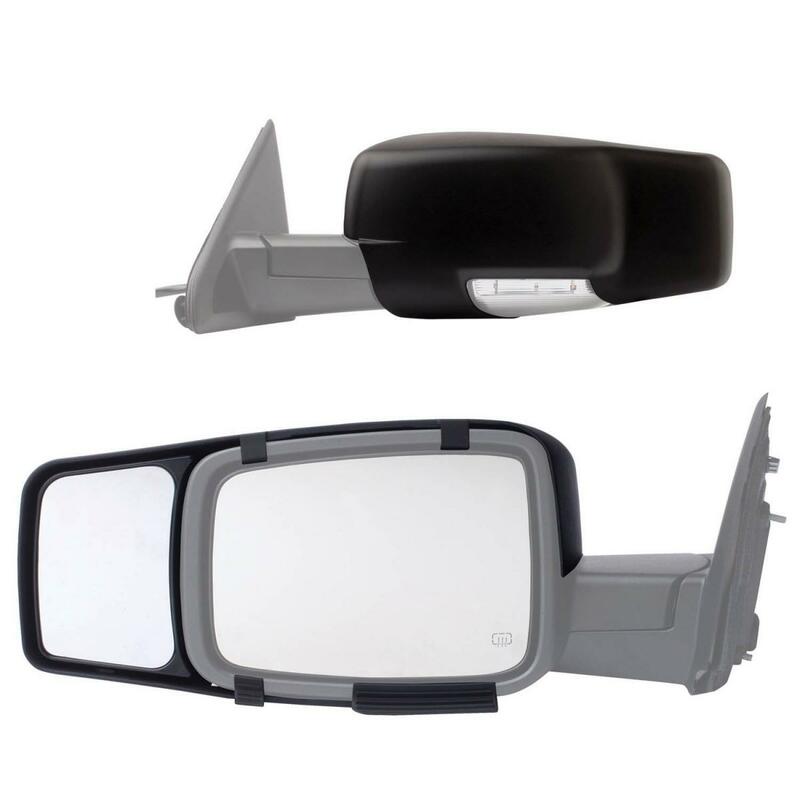 I use these mirrors to tow my 27' travel trailer, they work great and the price isnt too bad. Well, this just answered why I don't have my power folding mirrors. I thought the factory made a mistake. Wish I would've know that ahead of time. Real funny, nice topic guys! and trailer battery charging by means of the alternator when progressing. It's altogether incorporated with the wire tackle and intertwined in the under-hood combine box. I saw a post about mirrors and the post was " WHY DO SOME REBEL OWNERS DRIVE WITH THEIR MIRRORS UP"
The towing mirrors in normal positition has the smaller curved mirrors on the outside edge of the mirrors, the mirrors it turns out can be rotated up so the smaller curved mirror is now at the BOTTOM of the mirrors which now, gives a much better line of sight and can see traffic in a much larger area. I couldnt find out ANYTHING about rotating the mirrors up. I asked the dealerships serrvice MGR. Who is a real car guy and a friend of mine. I showed him the rotated mirrors and asked him if the up position made the mirror weaker while driving in hi winds at freeway speeds if the force of that could in anyway damage the mirrors. He said no, they are designed to do this. I asked him if this info. Was anywhere in owner manuals and if so where. He said he doesnt think that they put that anywhere and why they would leave that info. Out. The drivers mirror rotates up counter clockwise, & the passenger side mirror rotates up clockwise. I cant believe that i have towed my travel trailer for the last 2 summers not even realizing this was possible.